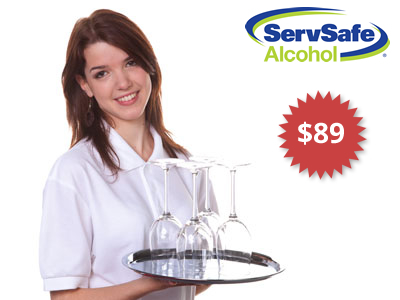 The ServSafe Alcohol Certification program prepares individuals to handle those risks related to alcohol service. Avoid fines, imprisonment, loss of liquor license, or even closure of the establishment by learning how to effectively respond in critical situations. 1. Review the ServSafe Alcohol Training materials (the study booklet includes ServSafe Alcohol practice tests). 2. Take the ServSafe Alcohol certification test at one of our locations. 3. Upon successful completion, receive the ServSafe Alcohol Certificate by mail. To register, please email us or call 800-676-3121. Criminal Liability. If found criminally liable for serving a minor or a guest who is or appears to be intoxicated, the server and/or the licensee can face fines, probation or jail time depending on the state. The operation could lose its liquor license, have to pay fines and may feel significant consequences in the cost of their insurance. Civil Liability. If found civilly liable for contributing to a guest's injury, the server, the owner/licensee and the operation all face the possibility of large monetary settlements. Depending on the size of the judgment, this could result in bankruptcy and will most certainly bring hefty court fees. Dram Shop Laws, allow for an establishment and its owners and employees to be sued by someone injured by a patron who had been drinking alcohol at the establishment. Make sure to talk to your insurance broker because many brokers and underwriters offer credits or discounted rates on liquor liability insurance for having responsible alcohol service policies and procedures in place.